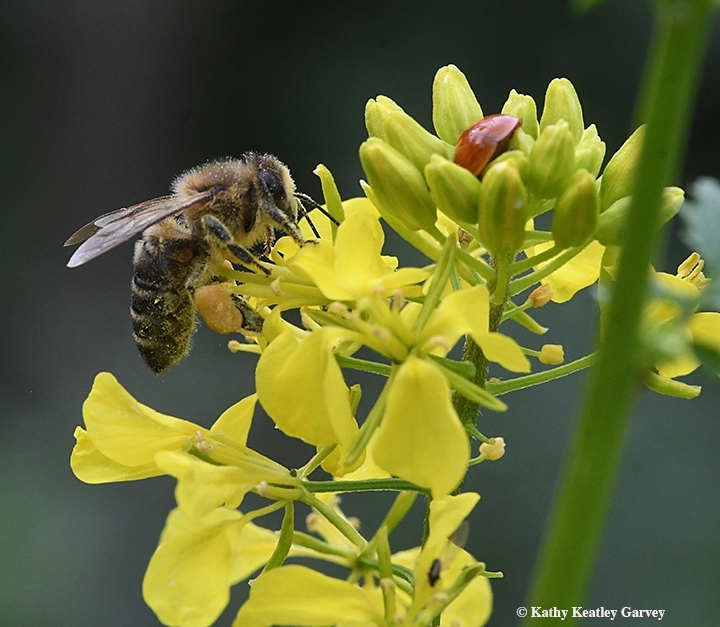 A honey bee is foraging head-first in the mustard. She's collecting nectar and pollen. She does not see the lady beetle, aka ladybug, thrust head-first above her. The honey bee is dusted with yellow pollen. The ladybug, not so much. The bee moves closer. The ladybug does not move. Honey Bee: "Hi, ladybug. Let's share the mustard, okay? 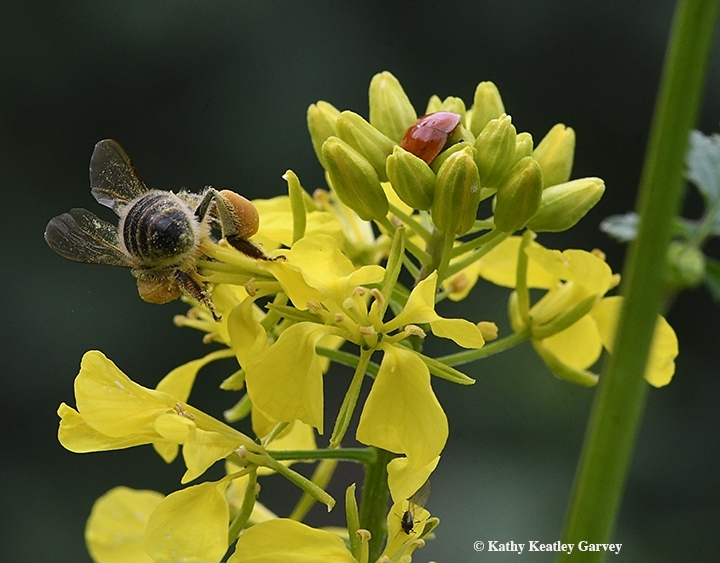 You take the aphids--I don't eat aphids--and I'll take the nectar and pollen. Is that all right with you?" The ladybug does not move. She neither sees nor hears her buzzing companion. 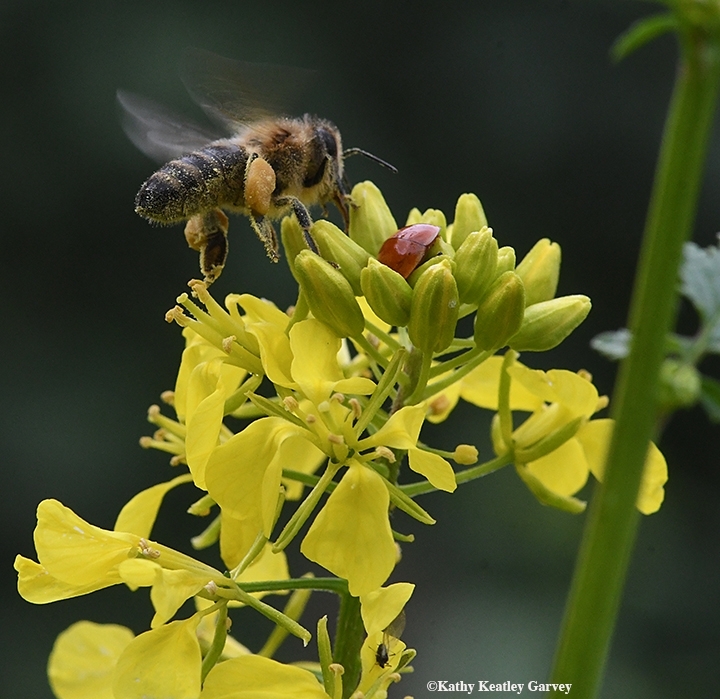 Honey Bee, louder: "I said, is that okay, ladybug? I'm here for the nectar and pollen! I don't want your aphids!" 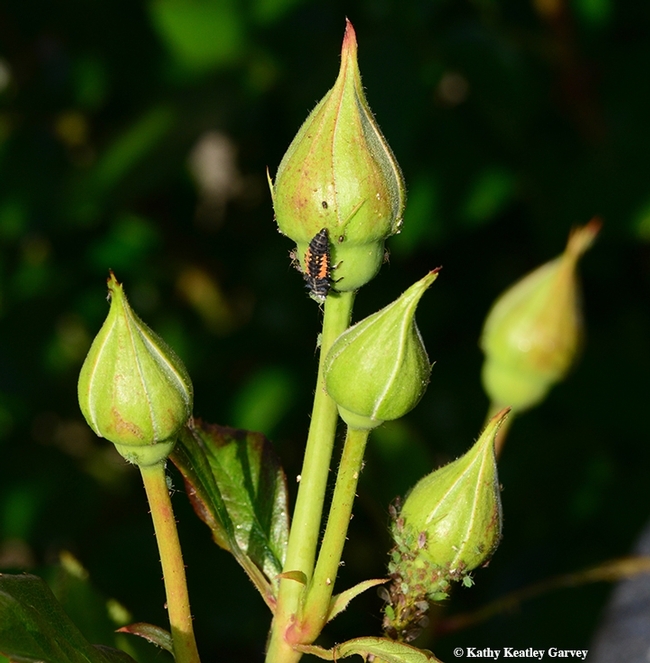 Ladybug, mumbling: "Aphids? Don't even think about eating my aphids. Buzz off, will ya?" 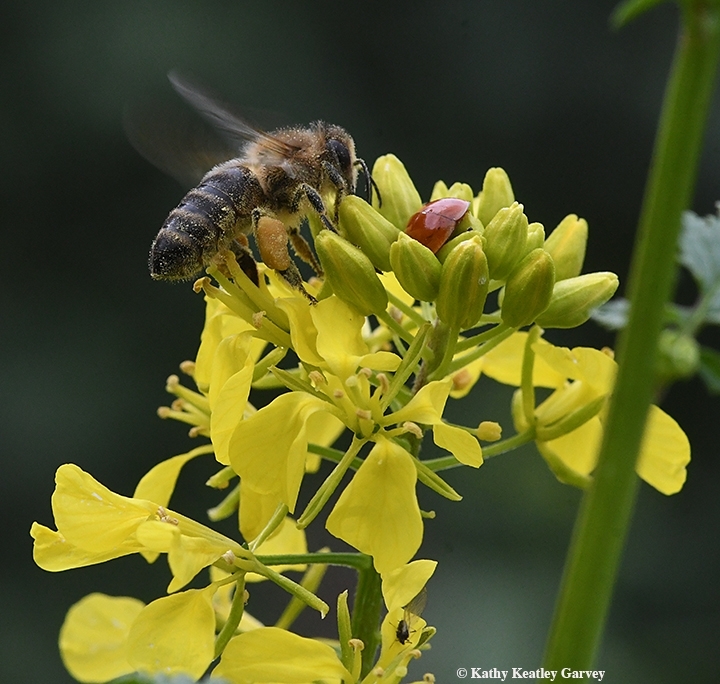 The honey bee buzzes off--to find more nectar and pollen. The drama ends as quickly as it begins. Another day in the mustard patch. It's a dog-eat-dog world out there. It's also a 'cat-eat-'cat world, that is, when a caterpillar eats another caterpillar. Or in this case, when larva eats larva. 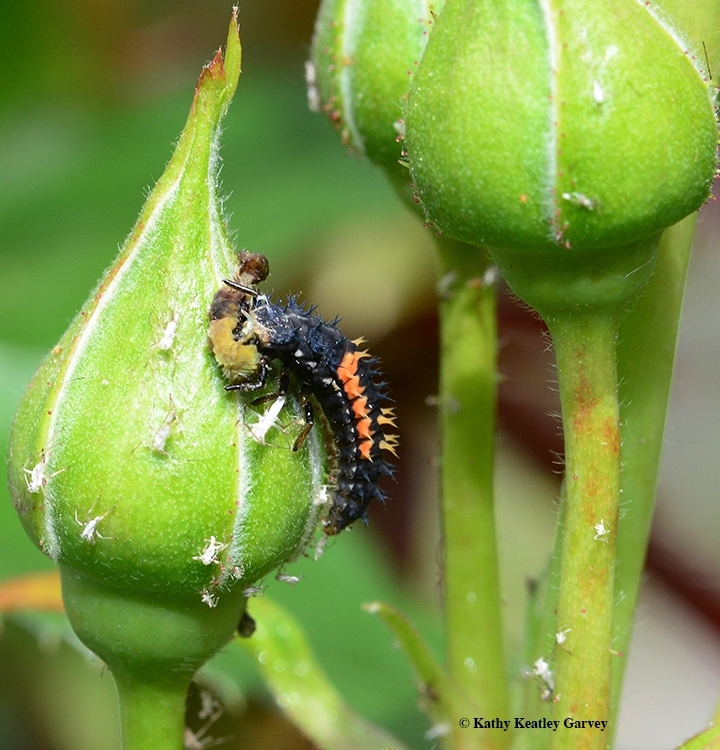 We recently spotted this lady beetle larva eating a syrphid fly larva on our yellow rose bush, "Sparkle and Shine." 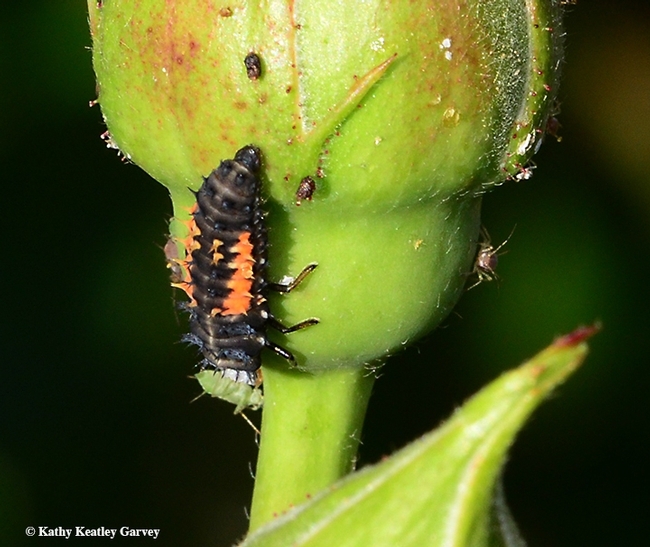 Both eat aphids, and that's exactly what they were doing until the lady beetle larva attacked--and began eating--the syrphid larva. These insects are beneficial. 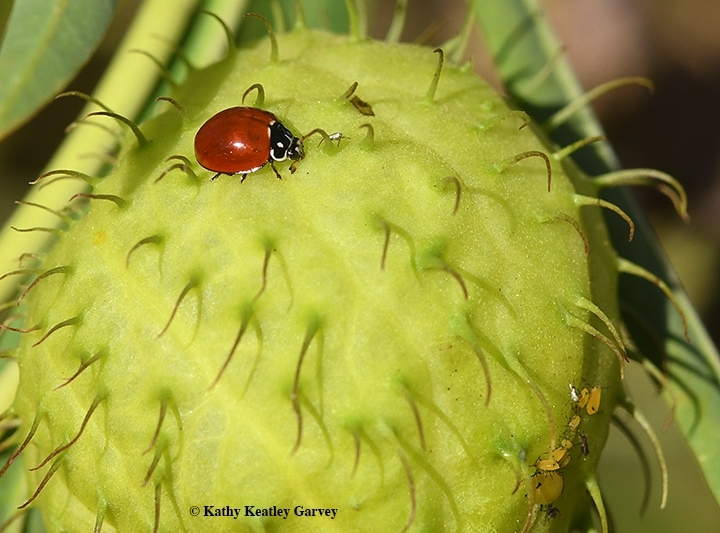 The lady beetle, as an adult, continues to consume those pesky aphids. The syrphid fly adult, aka hover fly or flower fly, is a pollinator. The hungry larva reminded us of Eric Carle's award-winning children's picture book, The Very Hungry Caterpillar, first published in 1969. 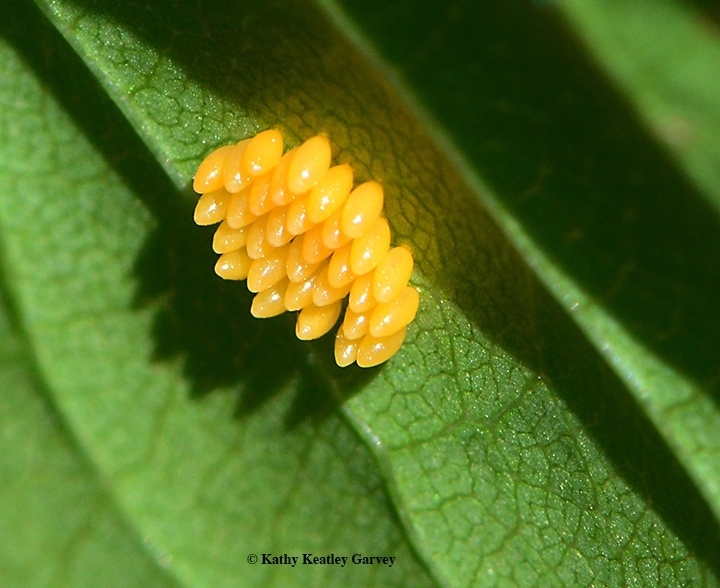 "One Sunday morning, a red-faced caterpillar hatches from an egg, and begins to look for some food. He eats through increasing quantities of fruit on the following five days, one apple on Monday, two pears on Tuesday, three plums on Wednesday, four strawberries on Thursday, and five oranges on Friday, and then, on Saturday, he has an enormous feast. By the end of Saturday, the inevitable happens and he is ill. After recovering from a stomach-ache, he returns to a more sensible diet by eating through a large green leaf before spinning a cocoon in which he remains for the following 2 weeks. Later, the 'big fat caterpillar' emerges as a beautiful butterfly with large, gorgeous, multi-coloured wings." Well, in this case, the menu differed. Our lady beetle larva didn't eat an apple, pear, plum, strawberry or orange. 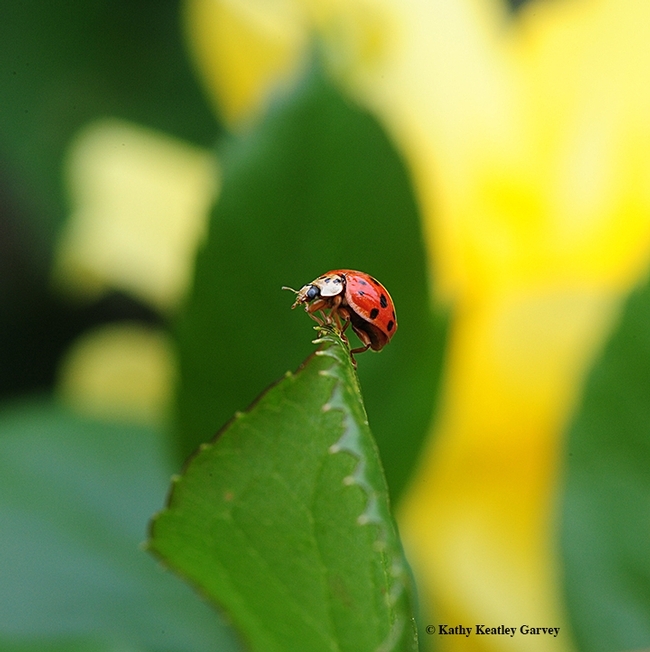 So here's this lady beetle patrolling a rosebud. It's early spring--April 15--in Vacaville, Calif.--and our little subject is looking for some tasty aphids. Or perhaps a mate. Oh, a visitor is on my rosebud, heading right toward me. Identify yourself, please! It's a wasp, a male parasitic wasp from the family Ichneumonidae (as identified by Robbin Thorp, distinguished emeritus professor of entomology at UC Davis). The Ichneumon wasp is probably looking for a girlfriend. 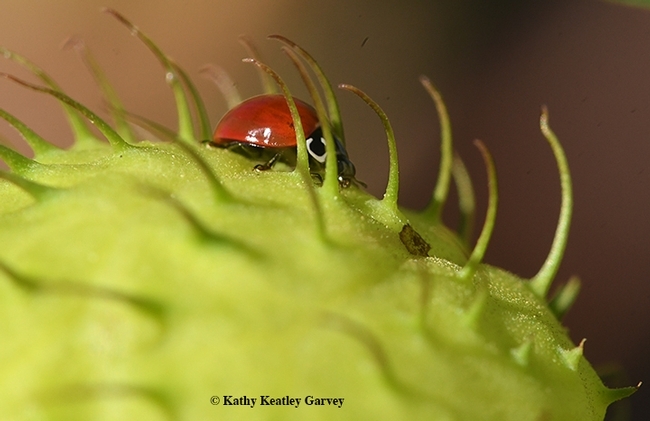 The lady beetle does not meet its expectations. The wasp hurriedly flies off. Its mate, when it finds one, will lay her eggs in caterpillars, including such pests as armyworms, cabbage loopers, tomato fruitworm and tussock moths, much to the delight and appreciation of agriculturists. The eggs hatch into larvae, which develop inside the host, killing it. Adult wasps emerge and the cycle continues. The wasp family is aptly named. "Ichneumon" comes from the Greek word meaning "tracker," a reference to its search for a host. Where's a caterpillar when you need one? Charles Darwin seemed a bit troubled by this, describing these parasitic wasps as "feeding within the living bodies of caterpillars." The caterpillar shrivels up and dies. Ichneumonidae is a big, big family of feeders. The number of described species? More than 24,000 worldwide. However, "estimates of the total species range from 60,000 to over 100,000--more than any other family in the order Hymenoptera," according to Wikipedia. That's probably more than any other family in the insect world, or for any other family, for that matter. Says BugGuide.net: "They vary greatly in size and color; many are uniformly colored, from yellowish to black and others are brightly patterned with black and brown or black and yellow; many have middle segments of antennae yellowish or whitish. The majority resemble slender wasps but differ from the stinging wasps (Scolioidea, Vespoidea and Sphecoidea) in having longer antennae with more segments (usually at least 16). Many have long ovipositors, often longer than the body." "Ichneumonids are notoriously hard to identify: aside from the sheer number of species, there are numerous cases of distant relatives that appear almost identical," BugGuide points out. "Any identification based solely on comparing images should be treated as suspect unless an expert has said there are no lookalikes for the species or group in question." 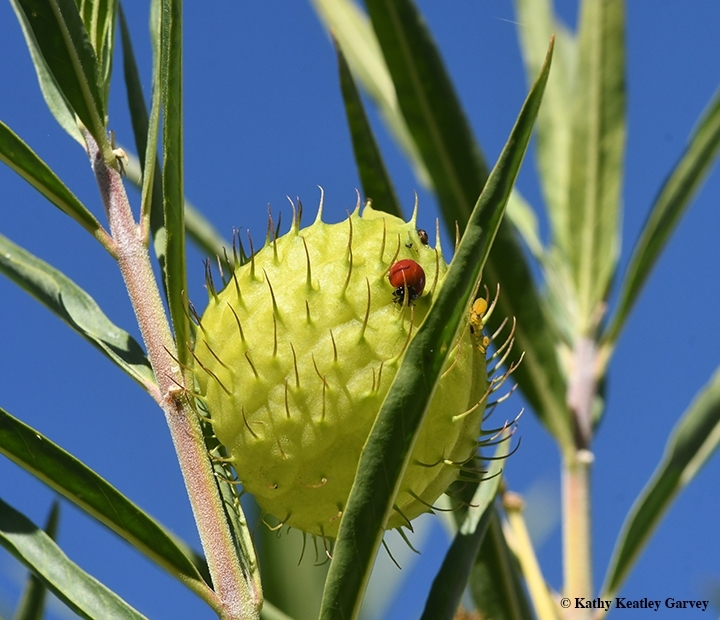 Can the larvae of lady beetles (aka ladybugs) eat aphids? Yes, they can. And yes, they do. 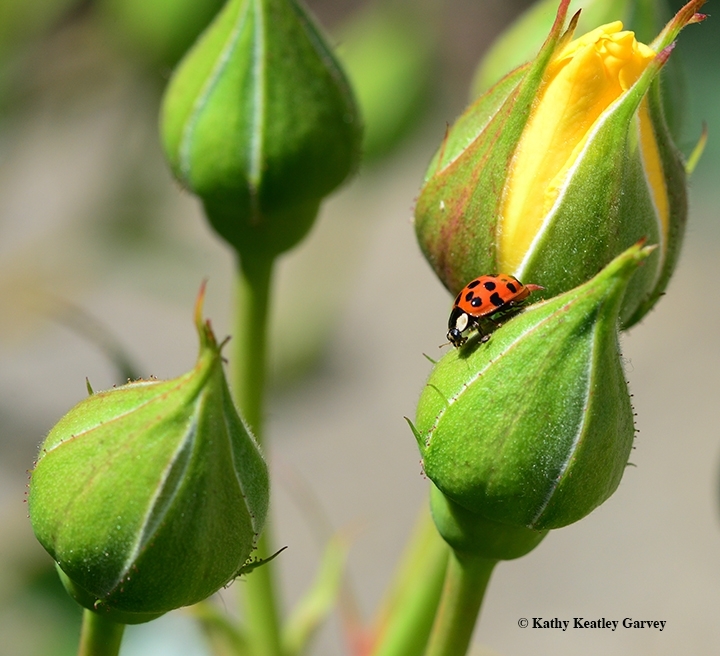 We spotted some lady beetle larvae on our yellow roses today and guess what they were doing? Right, eating aphids. Eating lots of aphids. The larvae look a little like miniature alligators, which is probably why they're often mistaken for pests. Oooh, what's that weird-looking thing on the roses? It can't be good. Kill it! Sadly, that's what many people do. 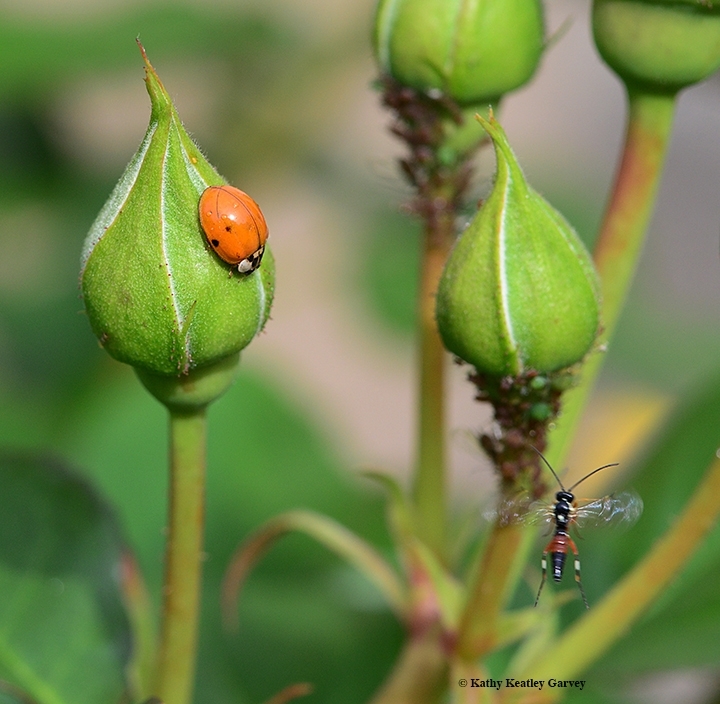 Lady beetles (family Coccinellidae) are beneficial insects that gobble up aphids, mites, scales and other soft-bodied insects. Check out the Quick Tips on the UC Statewide Integrated Pest Management Program (UC IPM) website for more information and photos. Bugs. Briggs. Bohart. What could be better? Well, youngsters visiting the UC IPM booth at Briggs Hall are in for a special treat: they will be gifted with lady beetles to take home. 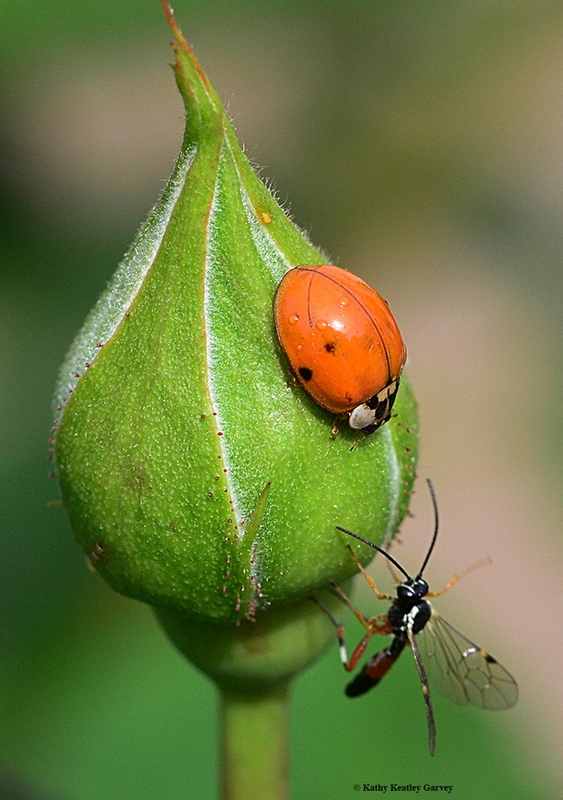 Watch out, aphids!